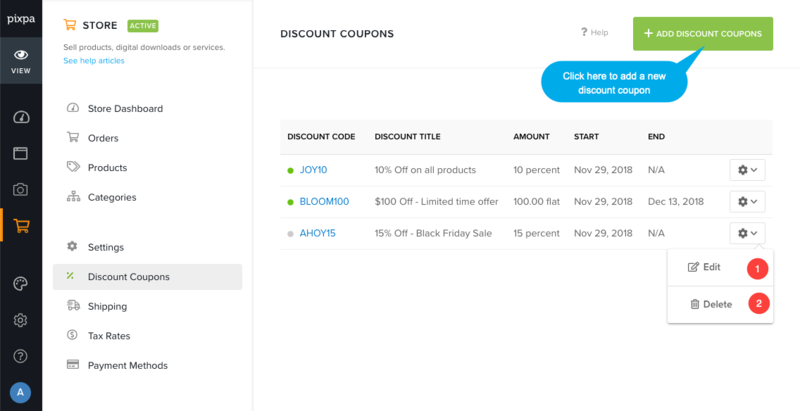 Percentage Discount: Enables you to apply a percentage based discount on the Cart Subtotal (total price of products in the cart). Flat Rate Discount: Allows you to create a discount code that reduces the cart total by a fixed amount. Note that fixed amount discount cannot be more than the cart subtotal (total price of products in the cart). Shipping Discount: Allows you to create a discount coupon that remove the shipping charges from the cart. In the Store section, click on the discount coupons link on left hand side. On this page, you would see the listing of all the coupons. You can also edit (1) or Delete (2) any existing coupon code on this page. On the discount page, Click on Add discount coupon button to create a new discount code. Discount Code: Specify the coupon code here. 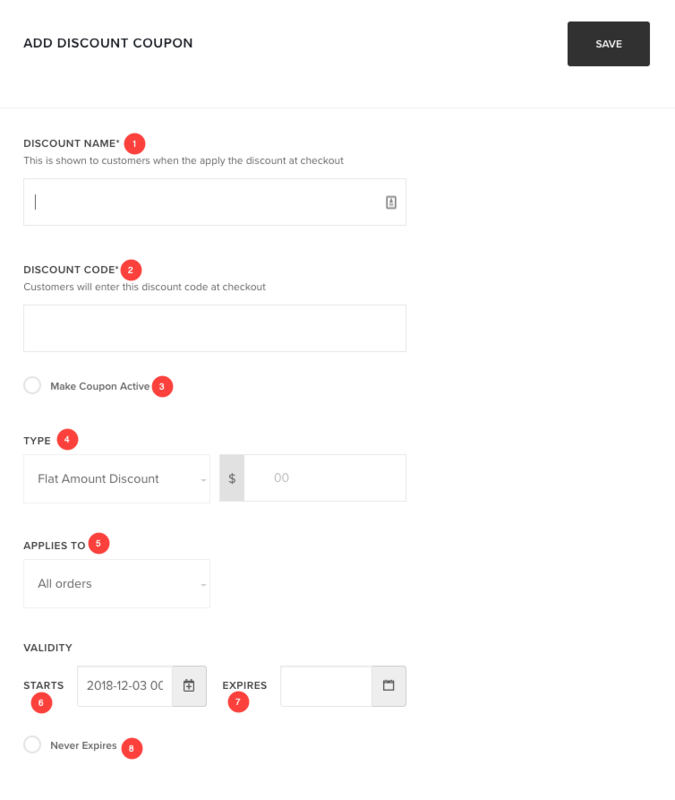 This is the code that your store visitors will put in the checkout page to get the discount. Note that discount coupons are not case-sensitive – which means BLACK50 is the same as black50. Make Coupon Active: Enable to make coupon active. Disabled discount coupon cannot be applied at checkout. Discount Type: Choose whether you want your discount coupon to give a Flat Discount or a Percentage Discount or Free shipping Discount. Specify the amount of discount you are offering. In order to create 100% coupon code add 100. Validity period – From: Define the time period (date) for which the discount code would stay active from. Validity period – To: Define the time period (date) for which the discount code would stay active to. Never Expires: If you do not want to specify any end date, Click on it. Particular coupon code would stay active always.